Disney's cornered the market on live-action adaptations and the man who really kicked it all off for them was Tim Burton, whose Alice in Wonderland made over $1B just nine years ago. While most of those movies have largely stayed true to the source material, or as close as can be, Dumbo, which is based on the beloved 1941 animated classic, is a Tim Burton movie through and through. 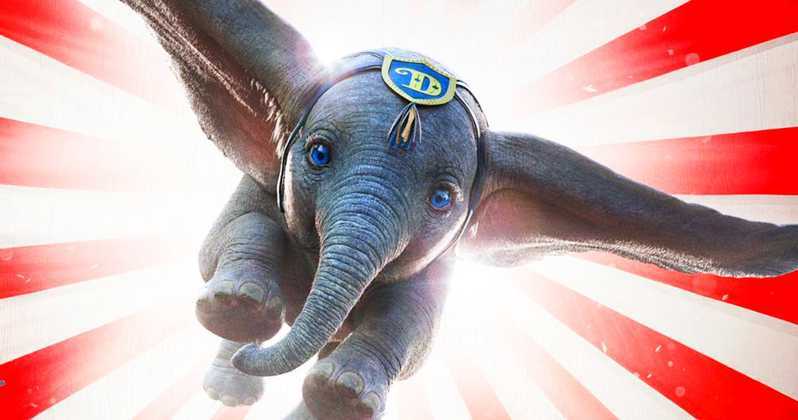 In the big-eared flying elephant Burton has found another outsider to champion, an injustice to fight, and chances are audiences are going to come away believing an elephant can indeed soar like a bird. While many of the familiar story beats are there, this isn't simply a Dumbo remake. The perspective from writer Ehren Kruger isn't solely from the elephant, but of the people around him. Sorry, if you were hoping for Timothy Q. Mouse to be Dumbo's pal and guide through his weird new life as a circus act, you'll be disappointed. Instead, Dumbo is cared for by Millie and Joe Farrier (Nico Parker and Finley Robbins), kids who grew up as part of a circus family with their father Holt (Colin Farrell) and mother, the latter sadly deceased. When Holt returns home from the war they are shocked and scared to see that he has lost his arm in combat. But more than that, he no longer has his once-popular equestrian act without his wife and partner. His horses have been sold by the shady-but-lovable ringmaster Max Medici (Danny DeVito), and Holt's new job is basically to tend to the elephants. "Sounds like a lot of shoveling sh", is as far as he gets before being interrupted by the kiddos. In classic Burton fashion, a moment of happiness, such as the reunion of the Farrier family, is marked by tragedy. And so too is the birth of baby elephant Dumbo, who emerges from under a pile of hay while his angry mother fiercely fights to protect him from the circus' cruel animal trainers. Dumbo's gigantic, floppy ears have others, including Medici, labeling him "ugly" and a freak. But the kids discover Dumbo's true talent hidden underneath those giant ears; he can fly when prompted by a single feather. The story takes off, literally, once Dumbo learns to fly but before then it's pretty slow as multiple new characters are introduced. Dumbo's newfound talent makes him a star for Medici but also draws the attention of VA Vandevere (Michael Keaton), whose Dreamland theme park bears a striking resemblance to Disneyland. There's also Vandevere's lovely trapeze artist and central attraction, Colette Marchant (Burton favorite Eva Green), who is tasked with riding Dumbo once Medici's business is bought by Vandevere. While the flying elephant is the character everything revolves around, Burton's attentions are split among a wide array of less-interesting ones. Farrell is pretty bland as Holt, and so are the kid actors who perhaps had trouble working with the CGI pachyderm. But DeVito is a treat as the salty, money-grubbing Medici, his heart of gold shining through in the actor's performance. What people want to see, though, is Dumbo, and the expressive animal is beautiful to behold and a joy to watch. Your heart will break at the many tragedies that befall him, and then they'll take flight with him at his many triumphs. This is Burton doing what he does best, shining a light on society's pariahs and standing up for those who are powerless. There's also a hearty animal rights message and a stand against simple corporate greed, both of which are timely considering the state of the world today. It's impossible not to watch Dumbo and think of the many changes made to modern day circus shows due to animal abuses. The Disney of 1941 is far from the Disney of today, and some of the aspects considered racist have been removed, although black strongman Rongo's treatment is still pretty questionable. Also, Burton takes clear delight in reimagining the somewhat infamous pink elephant scene, albeit without Dumbo going on a psychedelic alcohol trip. With gorgeous production design, a simple but timeless story about overcoming labels, and a hero whose courage is as big as his ears, Dumbo is poised to fly into a lot of people's hearts.